It’s very hard to figure out the end of anything. Stories are difficult and lives just happen and even people with a low opinion of themselves still consider that they are going to defy Eliot’s words and go out with a bang. When you look at it the Western conception of God is of a creative. He is called the creator, so if there is a God he is in the writing or storyboarding business if film is his chosen medium and he, she or it has the odious task with trying to figure out the ending of stories everyday. 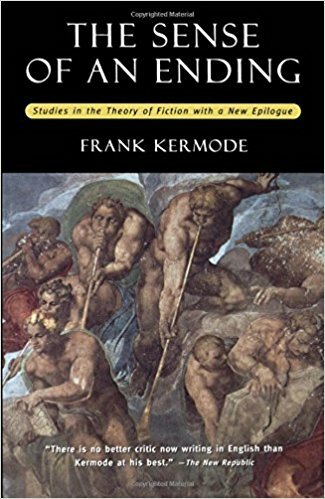 The British critic Frank Kermode wrote a tome called The Sense of an Ending. However, God probably doesn't have time to read it considering all the submissions including the King James edition of the bible, the Koran, the Bhagavad Gita which come his way. So writers and artists in general are kind of in the position of God, thought they, to some extent, have a freer hand. A novelist, short story writer, or long form poet is basically free to do what he wants, yet God, if we are to take the Old Testament to heart, is dealing with a creature who is born with the gift of free will. It’s as if someone started your story for you and then told you to figure out the ending, with no recognition of the setup and foreshadowing that are going to bring about a satisfying denouement. People die all the time and it’s rather anti-climactic. To quote Thoreau they "lead lives of quiet desperation," thinking there will be some ultimate piece of punctuation that will make sense of all the run on sentences, and lo there’s nothing—few survivors in this day of bare bones nuclear families and not even a decent turnout at the funeral.